Tubulointerstitial nephritis is a common cause of kidney failure and may have diverse etiologies. This form of nephritis is sometimes associated with autoimmune disease, but the role of autoimmune mechanisms in disease development is not well understood. Here, we present the cases of three patients with autoimmune polyendocrine syndrome type 1 who developed tubulointerstitial nephritis and ESRD in association with autoantibodies against kidney collecting duct cells. One of the patients developed autoantibodies targeting the collecting duct–specific water channel aquaporin 2, whereas autoantibodies of the two other patients reacted against the HOXB7 or NFAT5 transcription factors, which regulate the aquaporin 2 promoter. Our findings suggest that tubulointerstitial nephritis developed in these patients as a result of an autoimmune insult on the kidney collecting duct cells. Chronic tubulointerstitial nephritis describes a pattern of histologic changes commonly seen in patients with kidney failure that includes atrophy of tubular cells, mononuclear cell infiltrates, and interstitial scarring. It can develop from diverse backgrounds, such as kidney ischemia, adverse drug reactions, arterial hypertension, and diabetes, or it can be idiopathic. Tubulointerstitial nephritis may present in association with autoimmune disease, typically Sjögren syndrome1 or IgG4-related disease,2 but the role of autoimmune mechanisms in disease development is not well understood. Autoimmune polyendocrine syndrome type 1 (APS1; Mendelian Inheritance in Man no. 240300) is an autosomal recessive disorder characterized by autoimmune manifestations in multiple organs.3 APS1 serves as a model for tissue–specific autoimmune disease and has aided the understanding of autoimmune disease mechanisms in different complex disorders.4,5 The disease is caused by mutations in the autoimmune regulator (AIRE) gene, which encodes a transcription factor primarily expressed in medullary thymic epithelial cells. AIRE promotes ectopic display of tissue-specific antigens in the thymus—a process that is crucial for negative selection of autoreactive T cells and the establishment of central immune tolerance.6 Tubulointerstitial nephritis is a severe complication of APS1 that affects a subset of the patients.7–11 The underlying cause is not known. Autoantibodies against kidney tubules have been detected in sera from patients with APS1 and CKD,8–10 but tubular antigens have remained unidentified. We here report on three patients with APS1 developing ESRD is association with autoantibodies against the kidney collecting ducts and the identification of aquaporin 2 (AQP2), homolog of human homeobox B7 (HOXB7), and NF of activated T cells 5, tonicity responsive (NFAT5) as collecting duct autoantigens. Patient 1 was a girl who presented with hypoparathyroidism during her second year of life and was diagnosed with adrenal failure when she was 5 years old. By the age of 15 years old, she had developed alopecia totalis, oral candidiasis, and premature ovarian failure. Between the ages of 17 and 20 years old, she developed worsening uremia. Kidney biopsies revealed tubular atrophy, interstitial fibrosis, and focal, dense lymphocytic infiltrates, consistent with a diagnosis of chronic interstitial nephritis. At 23 years of age, she received a kidney transplant, which has functioned for 35 years at present on immunosuppressive therapy (cyclosporin, azathioprine, and methylprednisolone). Many years after transplantation, she developed hypertension and hypokalemia. Patient 2 was a girl who developed the hallmark components of APS1 at a relatively high age, with the diagnoses of hypoparathyroidism at the age of 10 years old and oral candidiasis at age 13 years old. She also displayed mild enamel dysplasia, nail pitting, and premature ovarian failure. At 14 years of age, she developed a clinical picture of apparent mineralocorticoid excess, with high BP, hypokalemia, normonatremia, and plasma renin activity and plasma aldosterone levels below detection limit. Hypertension and hypokalemia were controlled with spironolactone, nifedipine, and potassium chloride substitution. At the age of 18 years old, she displayed reduced kidney function and tubular proteinuria (plasma creatinine at 126 μmol/L and urine β2-microglobulin at 1.05 mg/L). A kidney biopsy disclosed tubulointerstitial nephritis. Tubular atrophy was seen throughout the tubular system and appeared to be the most pronounced in the collecting ducts (Figure 1, Supplemental Figure 1). By the age of 25 years old, she had stage 5 CKD, and maintenance dialysis was started; 2 years later, she received a kidney transplant. The patient has maintained kidney function on immunosuppressive therapy (cyclosporin, mycophenolate, and methylprednisolone) for 2 years at present. Patients with APS1 and kidney disease show marked atrophy of collecting duct cells. A hematoxylin–stained kidney specimen from patient 2 (left panel) is compared with normal kidney medulla (right panel). The patient’s kidney showed severe changes in the medullary region, with prominent atrophy of the tubular system, increased fibrosis, and occasional tubular calcifications (arrow). Inflammatory activity was low. Findings were consistent with severe chronic tubulointerstitial nephritis. cd, collecting ducts; dt, distal tubules. Patient 3 was a boy affected by multiple manifestations of APS1. He presented with oral candidiasis during his first year of life, and before the age of 10 years old, he had developed asthma, hypothyroidism, adrenal failure, growth hormone deficiency, chronic active hepatitis, autoimmune hemolytic anemia, dry eye syndrome, and exocrine pancreatic insufficiency. At 8 years of age, he developed symptoms consistent with apparent mineralocorticoid excess, with severe arterial hypertension, hypokalemia, low plasma renin activity, and low plasma aldosterone level. He was started on antihypertensive therapy and potassium chloride substitution. At the age of 9 years old, he displayed decreased kidney function and tubular proteinuria (GFR at 48 ml/min per 1.73 m2 and urine β2-microglobulin at 3.8 mg/24 h). Kidney biopsy revealed tubulointerstitial nephritis with tubular atrophy, fibrotic interstitium, and focal lymphocytic infiltrates. He experienced episodes with severe hypertension and was at one time referred to an intensive care unit with heart failure and impending pulmonary edema. At 9 years of age, he reached ESRD, and peritoneal dialysis was started. Three years later, he received a kidney transplant, which functioned well on immunosuppressive therapy (cyclosporin, azathioprine, and methylprednisolone). He died of causes not related to kidney disease at 18 years of age (Table 1, Supplemental Table 1). Tissue–destructive autoimmune disease processes in APS1 are accompanied by circulating autoantibodies targeting the affected tissues. To assess the involvement of autoimmune disease mechanisms in the development of kidney disease in patients 1–3, we screened their sera for autoantibodies against kidney tissue. Sections of fresh frozen rat kidney tissue were incubated with sera from patients with APS1 and healthy subjects, and autoantibodies were detected with a fluorescence–coupled anti–human IgG antibody. In all three patients with APS1 and tubulointerstitial nephritis, we observed distinct staining of tubular cells, with especially strong intensity seen for patients 1 and 2 (Figure 2A). To define the target cells, we costained tissue sections with patient sera and antibodies against markers of different tubular segments. Anti-AQP1 was used to label the proximal tubules, the descending thin limbs of Henle, and the descending vasa recta, whereas anti-AQP2 was used to identify the collecting duct system.12 Patient serum autoantibodies colocalized with the AQP2 antiserum, thereby identifying the collecting duct cells as targets of immunoreactivity (Figure 2B). Patients with APS1 and kidney disease harbor autoantibodies against kidney collecting duct cells. (A) Sera from patients with APS1 and kidney disease and controls were screened for autoantibodies against rat kidney tissue. Autoantibodies against kidney tubular cells were detected in sera from the patients with APS1 and kidney disease. (B) To define the target cells, tissue sections were costained with patient sera and markers of different tubular segments. Anti-AQP1 was used to label the proximal tubules, the long descending thin limbs of the loop of Henle, and the descending vasa recta, whereas anti-AQP2 was used to identify the collecting duct system principal cells and the cortical and medullary collecting tubules (connecting tubules). Autoantibodies colocalized with AQP2 and not with AQP1, thereby identifying the collecting duct cells as the targets of serum autoantibodies. We next sought to identify the molecular immune targets involved in collecting duct autoreactivity. We initially assessed AQP2 as a candidate autoantigen and used a radio–ligand binding assay to screen for AQP2 autoantibodies. Radio–labeled human AQP2 protein was produced in vitro and subjected to immunoprecipitation with sera from patients 1–3 and a broad selection of control sera, including those from patients with APS1 without known kidney disease, patients with interstitial nephritis not related to APS1, patients with IgA nephritis, patients with Sjögren syndrome, and healthy subjects. Serum from patient 1 reacted distinctly with AQP2, whereas AQP2 autoantibodies were absent in sera from the two other patients with APS1 and tubulointerstitial nephritis and all control sera (Figure 3A). To validate AQP2 autoantibodies with an independent method, we performed Western blotting using native antigen present in human kidney tissue homogenate. Serum from patient 1 reacted with distinct protein moieties, with molecular masses of 26 kD corresponding to nonglycoslated AQP2 and also, 30–60 kD corresponding to glycosylated forms of AQP2 (Figure 2B). Identification of AQP2 as a collecting duct autoantigen. (A) A radio–ligand binding assay was used to screen the patients with APS1 and kidney disease and various controls for the presence of AQP2 autoantibodies. AQP2 autoantibodies were detected in the serum from patient 1, whereas patients 2 and 3, patients with APS1 and without known kidney disease (n=90), patients with interstitial nephritis not related to APS1 (n=37), patients with IgA nephritis (n=40), patients with Sjögren syndrome (n=108), patients with various tissue–specific autoimmune diseases (n=60), and healthy subjects (n=155) were all negative for AQP2 autoantibodies. (B) The presence of AQP2 autoantibodies in the serum from patient 1 was confirmed by Western blotting using native antigen present in human kidney tissue homogenate. Serum from patient 1 reacted with distinct protein moieties with molecular masses of 26 kD corresponding to nonglycosylated (NG) AQP2 and also, 30–60 kD corresponding to glycosylated (G) forms of AQP2. (C) To better understand the relation between AQP2 autoantibodies and the development of kidney disease in patient 1, a time series of serum samples was investigated. AQP2 autoantibodies were detected in the earliest collected serum sample taken 3 years before uremia was noted, and they persisted throughout the development of kidney disease and to the most recently collected sample 2 years after kidney transplantation. (D) AQP2 autoantibody titers were compared between samples collected before and after kidney transplantation (collected at ages 20 and 25 years old, respectively), which revealed a decrease in AQP2 autoantibody signal after kidney transplantation. 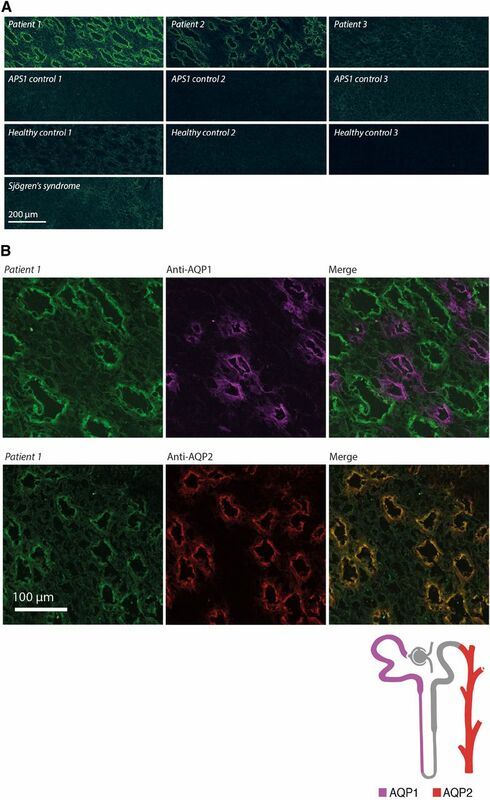 (E) To determine whether AQP2 autoantibodies reacted with an external epitope of AQP2, immunocytochemistry and confocal laser–scanning microscopy were performed on mouse collecting duct principal cells that natively express AQP2 under permeabilized and nonpermeabilized conditions. Serum from patient 1 labeled both permeabilized and nonpermeabilized cells, indicating that AQP2 autoantibodies reacted with an external epitope of AQP2. Scale bar, 20 μm in upper right panel; 25 μm in upper left, lower left, and lower right panels. AQP2 is a pore–shaped, transmembrane protein with polypeptide regions facing the internal and external sides of the cell. To determine whether AQP2 autoantibodies targeted an external epitope, we performed staining with permeabilized and nonpermeabilized cells. Mouse collecting duct principal cells were grown on permeable support in the presence of vasopressin to stimulate polarization and native AQP2 expression, and they were incubated with patient and control sera. Serum from patient 1 labeled both permeabilized and nonpermeabilized cells, indicating that AQP2 autoantibodies reacted with an external epitope on AQP2 (Figure 3E, Supplemental Figure 2). 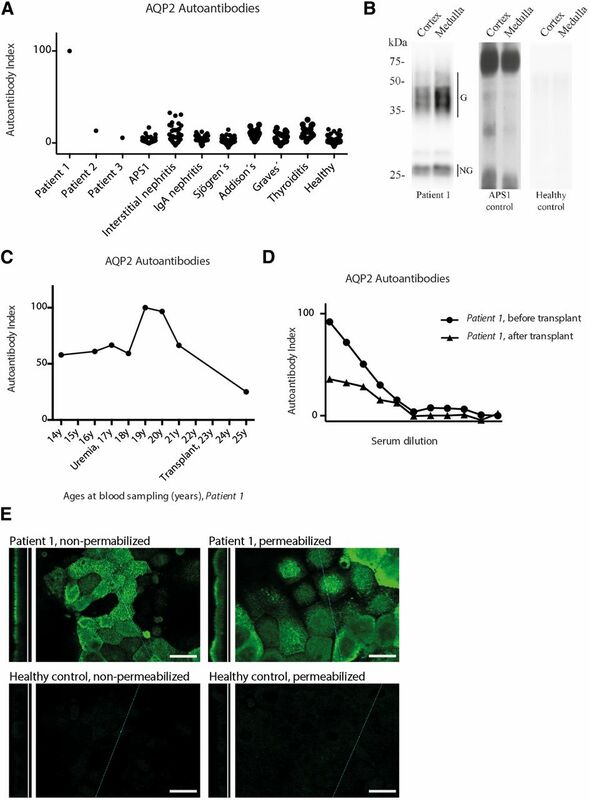 Because autoantibody binding may block functional activity of target antigens, we examined whether AQP2 autoantibody binding affected AQP2–mediated water transport in Xenopus laevis oocytes transfected with AQP2. Serum from patient 1 reacted specifically with AQP2-expressing oocytes but did not affect water permeability, suggesting that AQP2 autoantibody binding did not interfere with AQP2 function (Supplemental Figure 3). This observation of noninhibitory binding was in line with the patient’s clinical presentation, which did not involve symptoms of disturbed water balance at any stage of disease development. Because AQP2 proved to be a relevant target for only one patient and not the two other patients with tubulointerstitial nephritis and collecting duct autoantibodies, we then adopted a systematic approach to identify additional collecting duct autoantigens. We constructed a cDNA library representing the collecting duct cell transcriptome and screened the library with serum IgG antibodies from patients 2 and 3. Twelve clones were isolated by immunoscreening with serum from patient 2, of which 10 were identified as the rat HOXB7. Screening with serum from patient 3 generated three positive clones, of which two independent clones contained the rat homolog of human NFAT5 (Supplemental Table 2). The presence of serum autoantibodies against HOXB7 in patient 2 was further confirmed using a radio–ligand binding assay (Figure 4A). We were, however, unable to establish a radio–ligand binding assay for validation of NFAT5. Interestingly, the AQP2 promoter has previously been reported to contain transcription factor binding sites for NFAT5 and HOXB7.15–17 To confirm and locate these binding sites, we analyzed the 1000-bp 5′ flanking region of human AQP2 exon 1. Conserved response elements for the NFAT and the HOX family were identified at 490 and 207 bp upstream of the AQP2 transcription start site (Figure 4B, Supplemental Figures 4 and 5). Identification of HOXB7 and NFAT5 as AQP2-related autoantigens. To define the molecular targets of kidney autoantibodies in patients 2 and 3, a cDNA library was constructed using mRNA isolated from rat inner medullary collecting duct cells and screened with patient sera. Autoantibodies in serum from patient 2 reacted with HOXB7, whereas serum autoantibodies in patient 3 recognized NFAT5. (A) The presence of autoantibodies against HOXB7 in serum from patient 2 was confirmed using a radio–ligand binding assay in a clinical control material. (B) The 1000-bp 5′ flanking region of AQP2 exon 1 was analyzed for conserved transcription factor binding sites. Response elements for the NFAT (V$NFAT) and the HOX (V$HOXF) families were identified at 490 and 207 bp upstream of AQP2 transcription start site, respectively. We report on three patients with APS1 and kidney failure with marked atrophy of the kidney collecting ducts and collecting duct autoantibodies present in their sera. Tubulointerstitial nephritis and kidney failure seem to have developed in these patients from an autoimmune attack on the kidney collecting duct cells. APS1 features a variety of tissue–specific disease components that, despite of its name, involve both endocrine and nonendocrine organ systems. The endocrine components were early recognized as autoimmune.18 Successively, several nonendocrine components have also been linked with an autoimmune genesis, including intestinal dysfunction,19 lung disease,5,20 and prostatitis.21 We are here able to suggest a disease mechanism for tubulointerstitial nephritis in APS1 that involves autoimmune targeting and destruction of the kidney collecting ducts. Autoantibodies in tissue–specific autoimmune disorders typically target molecules that are key to the physiologic function of the affected tissue. In some autoimmune disorders, multiple molecules in a common tissue–specific pathway may be involved. This is well exemplified by autoimmune adrenal failure, where multiple enzymes in the steroid hormone synthesis have been implicated as autoantigens, namely 21-hydroxylase, 17-hydroxylase, and side–chain cleavage enzyme. The targets of collecting duct autoantibodies in the three patients with APS1 and tubulointerstitial nephritis proved to be separate but all related to collecting duct–specific AQP2. AQP2 is the primary regulator of water permeability in the collecting ducts, and it is crucial for the urine concentration mechanism.12 Short-term changes in water permeability along the collecting ducts are achieved by shuttling AQP2 between intracellular vesicles and the apical cell membrane, whereas long-term regulation occurs at the level of AQP2 gene expression control.12 Interestingly, NFAT5 is an important driver of AQP2 gene expression, with an influence comparable with that of vasopressin.17 NFAT5 knockout mice develop a profound atrophy of the kidney medulla with markedly inhibited expression of AQP2.22 HOXB7 belongs to an evolutionary conserved family of transcription factors called homeotic or Hox. Hox genes are expressed during embryonic development and decisive for the early organization of the body plan and subsequent development of segment structures. HOXB7 is expressed in the ureteric bud during formation of the embryonic kidney and continuously in its derivatives throughout kidney development.23,24 In contrast with most Hox genes, the expression of HOXB7 persists in the adult and becomes confined to the kidney collecting duct cells.23,24 The physiologic function of HOXB7 in the adult collecting ducts is not understood. It is, therefore, notable that the AQP2 promoter contains a conserved binding site for HOXB7,15,16 revealing a potential role of HOXB7 in AQP2 gene regulation. Tubulointerstitial nephritis represents a common end stage for a variety of disease processes that can affect the kidney tubules. Despite links with autoimmune disorders,1,2 the role of autoimmune disease mechanisms in tubulointerstitial nephritis is not well defined. Importantly, it remains unknown whether tubulointerstitial nephritis can develop from an autoimmune response specifically targeting the tubular cells. Autoantibodies against tubular basement membrane14,29,30 and tubular cells8–10,31 have previously been shown in patients with tubulointerstitial nephritis, but the molecular targets of these autoantibodies have not been characterized. Carbonic anhydrase II has been reported as an immune target in patients with autoimmune pancreatitis and tubulointerstitial nephritis.32 However, this enzyme shows widespread expression and cannot explain tissue specificity in kidney disease. To our knowledge, this is the first report identifying tubular-specific autoantigens in patients with tubulointerstitial nephritis. Many autoimmune manifestations of APS1 also occur sporadically in isolated forms in the general population, and characterization of APS1 components has helped in the understanding of autoimmune disease mechanisms in other and more complex disorders. For example, findings of tissue-specific autoimmunity in patients with APS1 and lung disease could be extended to patients with idiopathic interstitial lung disease without APS1.5 Future studies are needed to better understand the role of tissue–specific autoimmune mechanisms in tubulointerstitial nephritis in the general population. Three patients with APS1 and ESRD were investigated. The studied serum samples were collected from the patients after debut of kidney disease and before kidney transplantation (patient 1: at 20 years of age; patient 2: at 13 years of age; and patient 3: at 8 years of age). Patients with APS1 without known kidney disease (n=90), patients with Sjögren syndrome (n=108), patients with interstitial nephritis not related to APS1 (n=37), patients with IgA nephritis (n=40), patients with different organ–specific autoimmune disorders and without kidney disease (n=60), and healthy blood donors (n=155) were included as controls. All patients with APS1 fulfilled the clinical diagnosis of APS1, which required the presence of two or three of the hallmark components: chronic mucocutaneous candidiasis, hypoparathyroidism, and adrenal failure. Most patients had also undergone genetic analyses and been found with mutations in the AIRE gene. All patients and blood donors had given their informed consent for participation. The study was approved by ethical boards in Helsinki, Bergen, and Uppsala and conducted in accordance with the Declaration of Helsinki. Kidney tissue specimens from patients with APS1 were stained with hematoxylin and eosin and immunostained with anti-AQP1 (1:1500; HPA019206; Sigma-Aldrich, St. Louis, MO) and anti-AQP2 (1:200; HPA046834; Sigma-Aldrich). Serum samples were screened for autoantibodies against kidney tissue using an indirect immunofluorescence technique. The target cell specificity of patient autoantibodies was defined by costaining with established markers of different tubular segments. Cryosections (6-μm thick) of rat kidney were air dried and blocked with Background Sniper (Biocare Medical) for 30 minutes, and then, they were incubated with serum samples at 1:500 dilution overnight at 4°C. The sections were incubated with Alexa Fluor 488–conjugated goat anti–human IgG (1:500; A-11013; Invitrogen, Carlsbad, CA) for 30 minutes at room temperature (RT). Thereafter, the sections were incubated with a mouse monoclonal anti–AQP1 (1:200; ab9566; Abcam, Inc., Cambridge, MA) and a rabbit polyclonal anti–AQP2 (1:4000; ab62628; Abcam, Inc.) for 1 hour at RT. The sections were then incubated with secondary binders: 30 minutes with Alexa Fluor 568–conjugated goat anti–rabbit IgG (1:500; A-11011; Invitrogen) or Alexa Fluor 633–conjugated goat anti–mouse IgG (1:500; A-21052; Invitrogen). The slides were mounted with Vectashield Mounting Medium (Vector Laboratories, Burlingame, CA). Images were taken using a Zeiss Laser Scan Microscope 700 (Carl Zeiss GmbH, Jena, Germany) with the 20× objective (numerical aperture [NA] =0.8). All settings were identical for imaging with the different sera. Radio–ligand binding assays were used to screen patient sera for autoantibodies against AQP2 and HOXB7. cDNA clones of human AQP2 (SC300078; OriGene Technologies, Rockville, MD) and HOXB7 (SC122274; OriGene Technologies) were transcribed and translated in vitro in the presence of 35S-labeled methionine according to the supplier’s protocol (Promega TNT Systems; Promega, Madison, WI). Radio-labeled protein (30,000 cpm) was immunoprecipitated with serum samples (2.5 μl) in 96–well filtration plates (EMD Millipore, Billerica, MA). Sera were analyzed in duplicate. Positive and negative standards (a reactive serum and 4% BSA, respectively) were included on each plate. Autoantibody-antigen complexes were immobilized to Protein A Sepharose (GE Healthcare, Waukesha, WI), and radioactivity was measured using a liquid scintillation counter (Wallac 1450 MicroBeta; PerkinElmer, Waltham, MA). Autoantibody index values were calculated for each sample according to (sample − negative standard)/(positive standard − negative standard) ×100. AQP2 autoantibody titers were determined in serum samples collected from patient 1 3 years before and 2 years after kidney transplantation (ages 20 and 25 years old, respectively). The serum samples were diluted according to 1:1, 1:2, 1:4, etc. to 1:1024, and AQP2 autoantibodies were detected in analyses of 2.5 μl diluted serum sample. In a polarized cell model of the collecting duct principal cell,16 mpkCCD#11 cells were seeded onto permeable supports (Costar Transwell Permeable Supports, 0.4-μm Polyester Membranes; Costar, Cambridge, MA) and grown until confluent in DMEM/F12 media containing 5 μg/ml insulin, 5×10−8 M dexamethasone, 60 nM selenium, 5 μg/ml transferrin, 10−9 M tri-iodthyronine, 10 ng/ml EGF, 20 mM Hepes, and 2% donor bovine serum. When transepithelial resistance was >5 kΩ/cm2, 1 nM desmopressin (dDAVP) was added to the basolateral compartment for 4 days to induce AQP2 expression. Cells were fixed in 4% paraformaldehyde in PBS for 20 minutes at RT, and immunocytochemistry was performed as previously described.33 Permeabilization steps were removed for some conditions. Patient sera were diluted 1:3000 for all experiments, and an Alexa Fluor 488–conjugated goat anti–human IgG (1:1000; A-11013; Invitrogen) used for detection. A Leica TCS SL Confocal Microscope (Leica Microsystems, Buffalo Grove, IL) with an HCX PL APO 63× oil objective lens (NA=1.40) was used for obtaining image stacks with a z distance of 0.1 μm between images. Microscope settings (PMT offset and gain, sampling period, and averaging) were identical for imaging of cells treated with different sera. Standard procedures were used on human kidney protein homogenates, and blots were developed using enhanced chemiluminescence detection. Sera were diluted 1:2000. Inner medullary collecting duct cells were isolated as previously described35 and are explained in brief. Rats were euthanized, and kidney inner medullas were isolated immediately. Collected tissue was minced with a razor blade to 1-mm cubes and loaded into tubes prefilled with a digestion solution of collagenase B (2 mg/ml; 11–088–823–103; Roche, Basel, Switzerland) and hyaluronidase (1250 U/mg; final: 800 U/ml; 2592; Worthington). Samples were incubated for 1 hour at 37°C with shaking. Inner medullary collecting duct cells were pelleted by centrifugation, washed twice in 0.1% BSA, and then, resuspended in 0.1% BSA. Total RNA was isolated using Trizol Reagent (Invitrogen). A Poly A Sepharose Purist (Ambion Inc., Austin, TX) was used to extract the mRNA fraction. Isolated mRNA was converted to cDNA and cloned into a Zap Express Vector (Stratagene, La Jolla, CA) according to the instructions from the supplier. The cDNA library was screened with patient sera as described previously.36 Isolated clones were amplified with PCR, Sanger sequenced, and identified using the Basic Local Alignment Search Tool. The Gene2Promoter and FrameWorker 5.6 programs from the Genomatix software suite (version 3.2) were used to confirm and locate response elements for the NFAT and the HOX family transcription factor binding sites in the AQP2 promoter region of seven vertebrate species (Homo sapiens, Macaca mulatta, Pan troglodytes, Mus musculus, Rattus norvegicus, Bos taurus, and Sus scrofa). The flanking region 1000 bp upstream of the AQP2 exon 1 transcription start was selected from the built-in database (Matrix Family Library, version 9.1) and searched for models containing the response elements for the NFAT and the HOX matrix families. We thank the Biological Visualization Facility at SciLife laboratory for technical assistance and Cindy Wong for critical review of the manuscript. We also thank the Swedish Research Council, the Formas Research Council, the Torsten and Ragnar Söderbergs Foundation, the Swedish Rheumatism Association, the Novonordisk Foundation, the National Organization for Rare Disorders, the Danish Medical Research Council, and the Lundbeck Foundation for financial support. This article contains supplemental material online at http://jasn.asnjournals.org/lookup/suppl/doi:10.1681/ASN.2015101126/-/DCSupplemental.